Not what you were expecting to see, huh? I know this isn't the kind of thing I normally post on my blog, but this picture took a month and a half to do (or about 45 hours), so I'm going to show it to you! 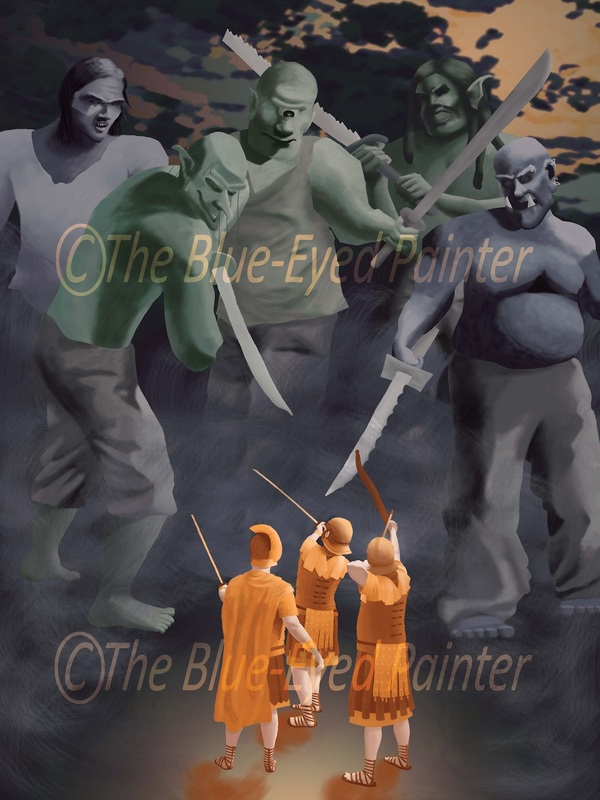 In case you're wondering, the Blue-Eyed Painter is the blog I'm posting my artwork to, so I can still share it with the universe without filling (HA! I just wrote post #4) this crafting/mommy blog with unrelated stuff. Check it out if you want to. I won't be offended if you don't. So, back to the artwork. About forever ago, a friend of mine asked me to make a piece of artwork for him, something to illustrate the fight between good and evil, Armor of God vs the forces of darkness, that sort of thing. Well, I finally got it finished! Hurray! Sometimes I liked the project, sometimes I wondered why on earth I was doing it at all. (Oh, yeah--I'm getting paid.) As you can probably guess, this kind of work isn't really my style, with the monsters and stuff. Even just having so many characters in the picture is different than what I like to do. I discovered in one of my illustration classes in college that I am just drawn (no pun intended) to artwork with very few characters who take up the whole picture. So composing, drawing, and painting (for lack of a better term--it's digital) a scene with so many characters was a little daunting. I had to talk my friend down to this many characters, even. He'd first described a whole battle scene.